Finding the right exercise bike depends on a lot of things including your body, preferences, and fitness goals. This is before we even get into the diversity of stationary bikes and the unique ride and exercise benefits. Luckily, we’ve taken the time to eliminate some of the guesswork by exploring two of the most popular styles — recumbent and spin — to find you the best models on the market. 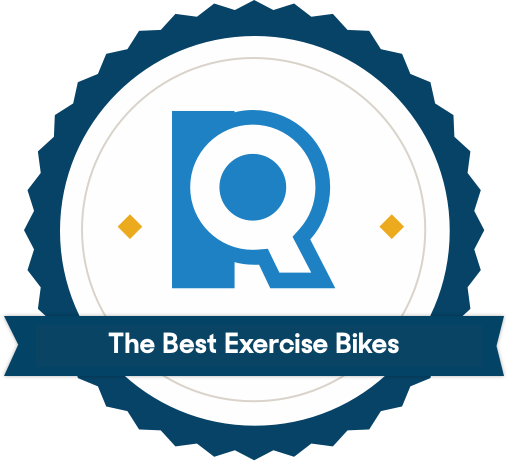 We looked at all the spin and recumbent bikes made by Bladez, Diamondback, Keiser, Nautilus, NordicTrack, Peloton, ProForm, Schwinn, Spinning, and Sunny Health — the most reputable companies in the exercise bike market. Our starting list of 57 bikes included a vast range of engineering choices, technology uses, and price points. To discover what elements make some bikes better than others, we consulted physiotherapy and fitness experts and dug into sports medicine data. Then we compared these learnings to the machines’ stats. Resistance mechanisms recreate the intensity of outdoor cycling, caused by wind, incline, and changing terrain. 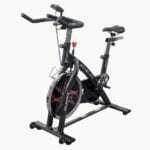 There are two exercise bike resistance systems, and weighted flywheels are at the core of each. One relies on a heavy flywheel alone, the other simulates weight by pulling on the metal flywheel with magnets. According to the physical therapist and the fitness trainer we talked to, it’s the low-tech, weight-only option that provides the better, tougher workout. We made that our top priority for fitness-focused spin bikes. The basic resistance type used in spin bikes is generated by a flywheel weighing anywhere up to 50 pounds. The resistance — and the ride feel — is only as great as the flywheel is heavy. The flywheel stores rotational energy, but the faster you go, the harder it is to keep pedaling at that speed. To increase resistance, direct contact braking tightens a felt pad brake against the flywheel, generating friction. For spin bikes, we only considered models with heavy flywheels weighing 30 pounds or more. For recumbent bikes, we prioritized ride smoothness over intensity. We looked to ECB resistance, but still wanted the substantial ride quality that a weighty flywheel provides. Magnetic braking requires electricity, and is the resistance type typically found in recumbent and upright bikes. (These styles also use electricity to power automatic resistance leveling and programmed workouts). Because ECB doesn’t require friction to up intensity, mechanical parts remain unstressed and silent, and the ride can be smoother and more consistent. However, because the user isn’t powering their own resistance, workouts are less intense. Since the magnetic power of ECB systems is the primary arbiter of tension, the flywheel can weigh far less, but we still drew the line at a respectable 20 pounds. Spin and recumbent bikes couldn’t be more different in terms of programming, but our standards for each were surprisingly similar: Clear, helpful, usable information that improved our workout. Spin bikes are simple machines — most of them don’t even need to be plugged in. No electricity means adjustments are manual and programming is limited. But we didn’t mind: Fiddling with programs and scrolling between metrics can be a distraction. According to Dr. Mitch Owens of Seattle’s Union Physical Therapy, “Simple works well.” He wrote off the need for extra programming or gadgets in order to get a good ride, suggesting that straightforward spin displays keep you on task. Basic performance feedback is enough — calories, time, distance, RPMs. Recumbent cycling can become a little lacklustre — unlike spinning, there’s no option to change your positioning or take off on impromptu sprints. So we wanted to see a satisfying range of programming, instituting a minimum of 15 resistance levels and 20 preloaded workouts. We prioritize long warranties for all exercise equipment. 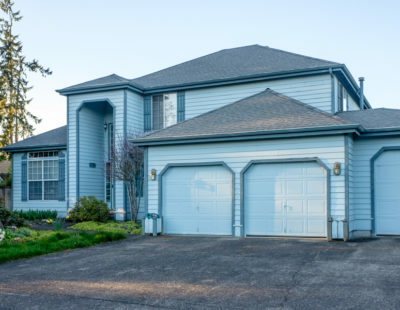 You’d be hard-pressed to find a piece of residential-use cardio equipment that didn’t have at least a handful of customer reviews detailing an unexpected breakdown or malfunction during the first year. The better the bike, the less likely it is you’ll be sent the one with a manufacturing flaw, but it’s not unprecedented to find a bad apple in a good bunch. Spin bikes tend to have shorter warranties than other styles, topping out at three years for parts and one year for labor. Recumbents, which are typically pricier and more elaborate in their construction, have longer warranties — as many as five years for parts and two years for labor. We came up with midrange requirements for both: A minimum one-year parts warranty for spin bikes, a minimum two-year parts warranty for recumbent. Spin bikes leave the hard work up to you, but some aspects of a spin workout should still feel effortless. We loved bikes with silky smooth rides, free of grinding sounds and vibrating sensations. We anticipated heavy flywheels would provide that ride, but testing revealed a second arbiter of quality. Our favorite spin bikes employ belts rather than chains to connect the movement of the pedals to the rotation of the flywheel. Of the two drive system types, chain is the cheaper and more old-fashioned. And while chain can last practically forever with regular tightening and lubrication, a belt provides a much smoother, quieter ride. The only downside is that you’ll eventually need to replace the belt when it’s stretched out. A heavy flywheel, while palpably important, does not alone create a good recumbent ride. Instead, we preferred bikes with a heavy flywheel and a heavy overall weight. Any bike is only as heavy as its components are substantial, and we deduced that higher-quality, all-metal components in our favorite recumbents were contributing to a more pleasant ride. Simple and well-crafted, this competitively-priced spin bike gave us our best ride. For a pure spin experience — just you and the machine — we love the Bladez Echelon. Quiet, consistent rotation and sensitive knob resistance helped us get in a quality ride every time. Whether you’re looking for a space saver exercise bike (a small exercise bike for apartment use) or a distraction-free workout (streamlined tech), this small and mighty bike delivers. While the straightforward display is hardly more than a stopwatch, the engineering of the bike itself is impressive. The flywheel rotates with a peppy, forward-urging motion that never feels bouncy, and in fact can reach some of the heartiest levels of resistance we experienced out of all the spin models. Despite the Echelon’s overall light body weight, there’s no shaking or sound as you pedal. We felt secure enough to freely amp up intensity and ride out of the saddle. If there’s anything more impressive than the Bladez Echelon’s solid construction, it’s the attractive pricing. Coming in at under $360, this exceptional bike costs less than half the price of other bikes that can’t compare in ride feel. It also excels in adjustability — the Echelon’s seat and handle had a wider customization range than any other bike we tested. Like most spin bikes, the Echelon uses a battery-operated display that can’t control intensity and doesn’t offer workout programs. If you need workout programs and metrics to keep you motivated, check out the Diamondback. Some testers, however, found the simple consoles less distracting than higher-tech versions, making it easier to focus on the workout. The Echelon’s console may be bare bones but offers everything you actually need — performance stats like calories burned, time, distance, and RPMs. 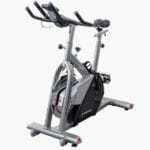 Effortlessly smooth and fully equipped, this spin bike is substantial both in heft and technology. Our ride experience on the 510Ic was luxuriously smooth and steady. The heavier body of the Diamondback 510Ic means it sits solidly on the floor, holding you secure as you hit higher intensities or stand to pedal. And thanks to the variety of programming, we were confident we could find a workout for any fitness goal. When it comes to adjustability, the DiamondBack doesn’t have quite the same extension range as the Bladez. That said, the seat can ratchet up higher, making it a better fit for users with extra long legs. We also appreciated the numbered and lettered adjustment levels on this bike — a Diamondback feature that was sorely missing on most other spin bikes. Rather than have to rediscover your perfect placement every time someone else goes for a ride, you can just remember that your seat sits at “G” and quickly slide it into place. All the stand-out qualities of the other recumbents we tested, united in one superior, reasonably-priced machine. The ProForm 740 outperformed what we expected of a recumbent, improving on every standard feature and answering to every need. We loved the sleek, sculpted design, and appreciated how easy ProForm makes it to get comfortable — the seat cradles without confining, the pedal rotation remains effortless even as our effort increased. Of all the recumbents we tested, the ProForm struck this delicate set of balances best. The technology of the ProForm 740 is both extensive and immediately usable. The console is a classic iFit creation (the fitness tech company created by ProForm and NordicTrack’s parent entity, ICON Fitness). 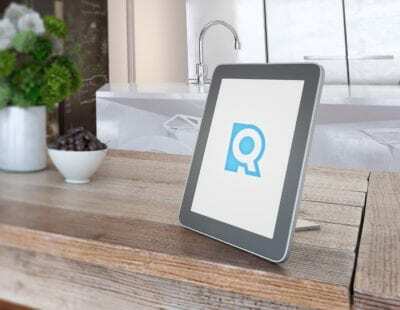 Its high-quality, 7-inch touchscreen and bold icons depicting program categories makes for an intuitive interface that anyone will feel confident navigating. The ProForm won lots of points for adjustability. Simply lift up on the seat adjustment lever and the seat will easily move when you push it. Other bikes immediately started inching (or flying) down the shaft as soon as we moved the lever, which was sometimes a startling experience. We also enjoyed the innovation in the bike’s clever, tilting console. Twist the knob at the console base and it nods up and down, allowing you to tailor the positioning to your seated height. Since the majority of user interaction with the console takes place through the touchscreen, having it within easy reach and at a proper angle for clear sight is vital. 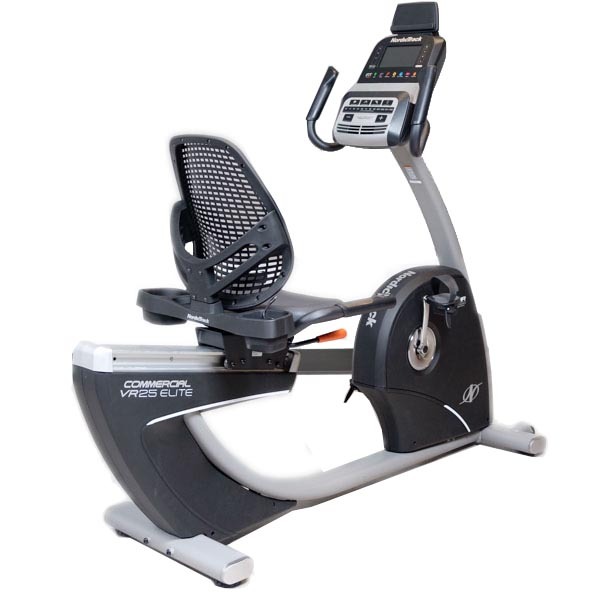 Like most recumbent bikes, the ProForm is too heavy and bulky to be easily maneuvered. This model will serve you best if you can dedicate space to its permanent storage, rather than attempting to wheel it out of sight at the end of every workout. If storability is vital, look to a spin bike like the Echelon. A more generously sized ProForm 740, we’d recommend it for tall users or anyone who requires more room between them and the console. NordicTrack and ProForm equipment are produced by the same manufacturer, so it’s no surprise that a lot of our favorite ProForm features show up on the NordicTrack. The two bikes are essentially equivalent, but the NordicTrack VR25 is bigger, more expensive, and ideal for anyone who wants a more luxurious bike or needs the extra leg room. This bike combines sophisticated technology (replete programming, beautifully clear touchscreen, intelligently organized performance stats) with ergonomic design. We noted how the seat feels both comfortable and secure: You can pedal with high intensity and stay supported and centered — no bouncing or sliding into a slump. Most recumbents place water bottle holder and heart rate sensors near the console: Typically, the bottle holder fixes onto the console stem, while the heart rate sensors are inlaid in the handlebars that curve on either side of the display, forcing you to lean forward and reach if you want to grab your water or check your heart rate. The ProForm 740 allows you bring these amenities into reach by manipulating the placement of the console; NordicTrack VR25 solves the issue another way. It stores both holder and heart rate handles at hip-level, allowing you to hydrate and check exertion without breaking cadence or even shifting out of your seat. The lack of a pivoting console is a point lost for NordicTrack. It isn’t suitable for users of any height. In overall feel, the NordicTrack is roomier than the ProForm, but that breathing room comes from the fact the console sits 5 inches higher and 5 inches farther forward. If you need or want that extra space, you will enjoy NordicTrack’s dimensions. But shorter users may find themselves squinting to see the touchscreen and straining to hit buttons. You’ll sacrifice some usability and comfort but save $400 compared to our top pick with this simple, functional bike. The Nautilus R616 is a clean-cut machine. Smaller and more streamlined than our fully-loaded top picks, it still provides enough programming to answer most people’s wants. Rather than an of-the-minute, iFit-equipped console, Nautilus’s offers rows of actual buttons and a traditional blue LCD screen, with bar charts mapping progress. We found the whole setup user-friendly (though admittedly old-school) and were impressed with its satisfying range of preloaded workouts and detailed performance stats. Nautilus wisely locates the heart sensors themselves on the seat-side handles — allowing you to measure heart rate from a comfortable position. The Nautilus R616 has its quirks, but also its pleasant qualities. During testing, we logged enjoyable miles thanks to smooth, substantial resistance created by the heavy flywheel. This ride feel, plus an easily portable body and an amazing five-year parts warranty, prove the quality of this bargain-priced pick. The ergonomics aren’t great — due in large part to the stiff seat back and not-so-cushiony cushion. The main issue: The seat adjustment has a steeper learning curve here than on the other models. When you open the lever, the seat rocks side to side and slides down the bar, making adjustments more taxing. We got the hang of it after a couple clumsy attempts. Unlike ProForm and NordicTrack, the heart rate sensors don’t report in raw numbers (145 BPM, for example) but instead as a percentage. A flashing bar chart shows what percentage of your max heart rate you’re hitting (like 65%) and where that puts you on the spectrum from Warm-Up to Fat Burn to Aerobic to Anaerobic. This seemed more like a guesstimate than a useful statistic, but the truth is that the heart rate provided by any exercise equipment is a guesstimate. Even on the nicest, most luxurious machines we’ve tested, we’ve noted that our heart rate jumps from low to high when we know we haven’t yet exerted ourselves. That said, we still prefer a number if only to help track our fitness level over time. The user experience on each bike style is different. 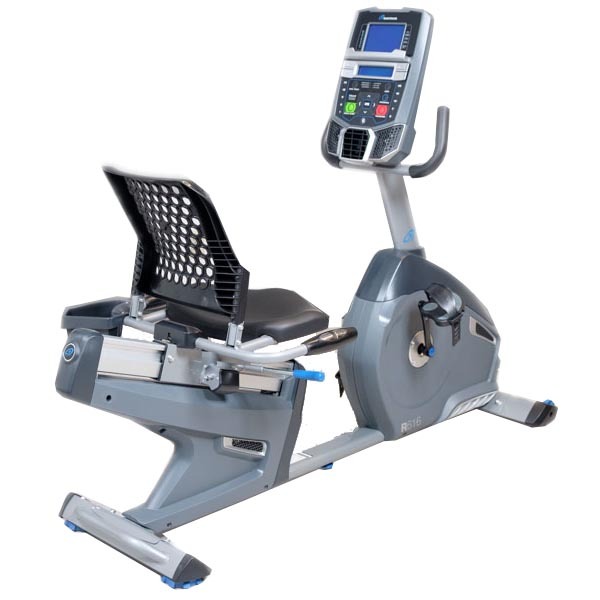 The exercise bikes used in high-intensity spin classes model their construction after speedy road bikes, and support the physically demanding way cyclists employ them. Spin bikes pitch the rider forward at a 45-degree angle, with curved handles that are on roughly the same plane as the seat. Resistance levels are typically controlled by a knob or lever, but the real intensity comes from how quickly you pedal. As you increase speed, the flywheel begins to store your excess effort, generating a powerful forward momentum. But reaching and maintaining that point of inertia requires a ton of force. With a low, long profile and a bucket seat, recumbent bikes allow the rider to lean against the backrest with legs outstretched at a shallow decline from the hips. While recumbent riding foregoes the core engagement demanded by upright bikes, these bikes do provide greater back support. You don’t have to carry your body weight on top of the pedals, which reduces joint load, while motorized resistance levels recreate the intensity of weight plus terrain. Control intensity and switch between programs using the consoles. Many manufacturers declare the “effective” flywheel weight (what the resistance feels like with the magnetic ECB system at work) or nothing at all. We rummaged through owner’s manuals and clogged up customer service channels to nail down the correct numbers, but noted that when the flywheel weight was hard to find it usually led to a disappointing number. Takeaway: If the stats are hard to find, the machine probably isn’t great. Exercise equipment manufacturers sometimes excel in producing one style, but miss the mark on another. One example: The well-known bike brand Diamondback makes a superb (and expensive) spin bike, but a sub par (and still expensive) recumbent bike. The recumbent model we tried, Diamondback 910 Sr, was one of the most comfortable bikes we tested, but we were disappointed with its outdated console and vexing adjustments. Spin bike handlebars and seats should move up and down, fore and aft. Recumbent styles don’t boast the same four-way range, typically allowing for just leg length changes, but the best make that movement easy while also providing console adjustment. A good rule of thumb on any bike style: The knees should maintain some degree of bend at their fullest extension. For spinning, you want an ample 30 degree bend. On recumbents, straighten out to 10 - 15 degrees. Try to avoid any exercise bikes with exposed belts or chains. Cheaper, older models can leave these elements out in the open, making it very easy for children or pets to get caught in the moving parts. On average, 12,714 children suffer injuries from home exercise equipment each year – the majority of these being from stationary bikes. 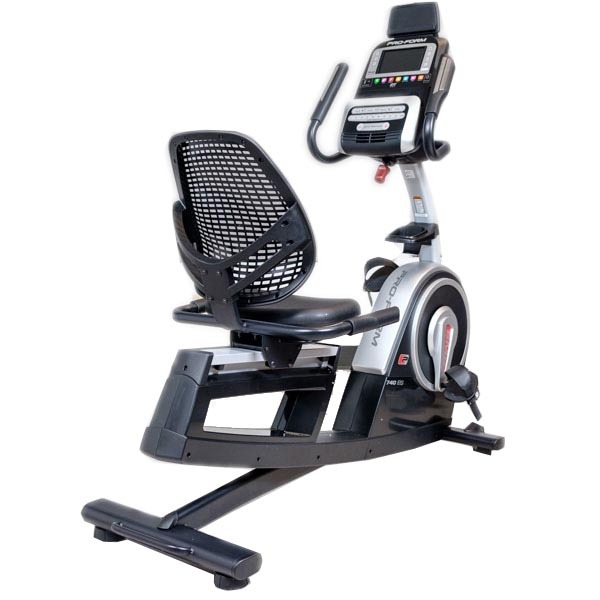 Exercise bikes like the Bladez Echelon and the Diamondback Fitness 510Ic Indoor Cycle have covers that enclose these moving parts to help minimize the chance of injury. What about air assault bikes? If you’re looking for a cycling workout that recruits upper body, too, there’s also bike styles with moving handlebars. These include Hybrid or Cross Trainer Bikes (a mashup between an elliptical and an exercise bike) as well as Air or Fan Bikes, growing in popularity thanks to their use in CrossFit. These strenuous machines require you to generate your own resistance via air fan, a distant cousin to the weighted flywheel. Where can you buy a spin bike? 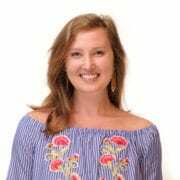 While you can buy any exercise equipment from the manufacturer (and comparing the price on their website to the numbers you find elsewhere is a smart shopping tactic), we typically go through Amazon. The discounts available through Amazon and its sellers typically outpace the MSRP of the manufacturer. Plus, it’s easier to track on that site how the price has varied over recent months so you can Add to Cart when the time is right. Which is better: exercise bike or treadmill? A lot of this depends on what you’re looking for in a workout and your current level of fitness. If you’re just starting to focus on your fitness, an exercise bike offers low-impact cardiovascular exercise. A treadmill requires more weight-bearing, which will engage your entire body and burn more calories (than the same intensity level on an exercise bike). However, the low-impact workout associated with an exercise bike means a greater opportunity to increase your heart rate without putting substantial stress on your knees, feet, or hips. We have pedaled and jogged, stretched and strode our way through multiple species of fitness equipment and accessories. We take the hard work out of finding the best in a ton of exercise categories so you can save your energy for the workout.